Emily Carroll is probably my favorite working comics author right now (only surpassing James Kochalka because American Elf is over and I have no interest in J.K.’s other work). His Face All Red is the pinnacle of horror comics, and Margot’s Room absolutely destroys me in ways I can’t quite explain. Carroll always manages to deliver punch and awe and fear in very particular ways that no one else even approximates. Part of this is a genre problem–who are her contemporaries? Not just people working in indie and online comics, but people who are tackling the same kind of subject matter and material–neomedieval stories that don’t quite fit; love stories that avoid triteness like the plague; an art style equally stylized and yet clean and obviously masterful. The work being done at Road of Knives approximates Carroll, but eschews all plot; it is a different game with some of the same pieces. The heart of the story is about consequences for actions. No, not really. It is more than that. The 3 Snake Leaves is about how the past is constantly haunting us, and that the things we do are constantly echoing into the future. More tragic, there isn’t any way to control those vibrations, those echoes of past into present into future; they go on, and we are mostly bystanders. For some reason, Emily Carroll is able to capture this in a way that no one else is able to. When I think of comics about inevitability, I immediately come up against comics that are about looking backward: Backderf’s My Friend Dahmer or Bechdel’s Fun Home. Both of those are comics based on the past that make an effort to understand how we got from point A to point B, and maybe more importantly, they are comics that are biographical; they have an actual history, traceable by documents and time stamps and police reports and blood stains. What Carroll is doing is different. She is capturing a process, a way of acting and being in the world, without ever remarking on it. Her earlier work in The Death of José Arcadio is a wonderful example of this outlining of process–the blood runs all the way to the woman. The blood isn’t blood, or it is, but either way it doesn’t matter; the comic is about information traversing time and space. It is about showing a communication process; it is about watching trauma and pain move through the world like water through a pipe. This is where Carroll shines. Things move through time, destroying anything in their wake. Fidelity is showing, not explaining. Compassion is mourning. 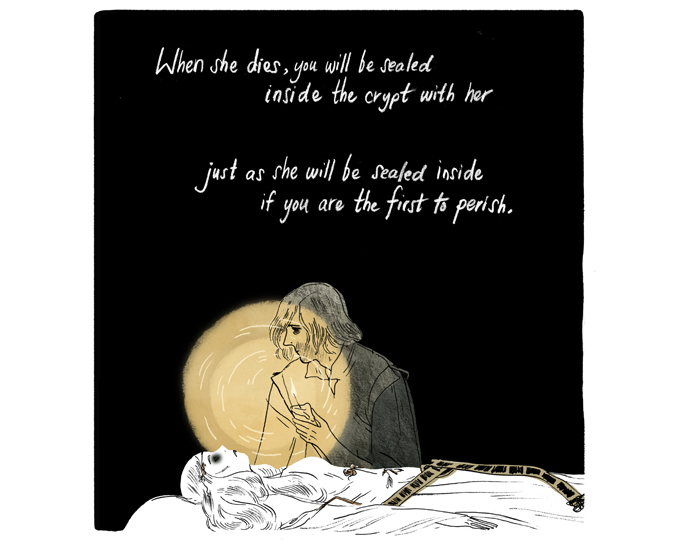 This entry was posted in Comics and tagged comics, death, emily carroll, the 3 snake leaves. Bookmark the permalink.